Although he was raised around horses, equine photographer Arnd Bronkhorst has not always had a clear career path. 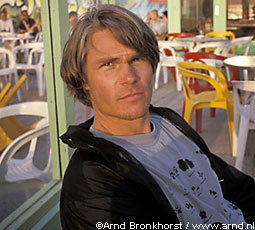 Born in the Netherlands, Arnd occasionally rode horses and participated in eventing growing up. Originally intending to follow a career in science, his college plans were sidetracked when he was drafted into the military. While waiting for enrollment into college after the service, Arnd picked up work as a photographer’s assistant. Much to his surprise, he found himself enjoying the work and decided to pursue a career in photography. As Arnd began to develop as a photographer, he realized he needed a focus: a specialty that would set him apart from other talented photographers. Drawing on his interest in biology and on his equestrian past, he decided to concentrate on horses as the subject for his art. 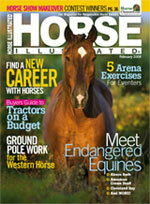 Arnd’s Abaco Barb photo was the cover of the February, 2009 Horse Illustrated. Arnd’s venture turned out to be a success. Today he is world-famous for his equine photography. Early in 2006, he was given an opportunity to visit the Bahaman Island of Great Abaco, where the last eight horses of the Abaco Barb breed reside. Working with Milanne Rehor, caretaker for the horses, Arnd was able to photograph the small herd in its natural habitat. Listen to an exclusive interview with Arnd Bronkhorst, where he describes what it was like on the island with the Abaco Barbs. The complete story of the Abaco Barb and more of Arnd Bronkhorst’s rare photographs are featured in the February 2007 issue of Horse Illustrated. For more information on Milanne Rehor and her effort to save the Abaco Barb, visit www.arkwild.org.